What’s wrong with a static html website, anyway? Long before the DOT-COMs, Steve was online at 300 baud, using local BBSes, dialing up to networks like CompuServe, Prodigy and The Source. Even beta testing Viewtron & SEFLIN (The Southeast Florida Library Information Network). When a buddy wrote a bbs and asked for Steve’s opinion, the constructive criticism didn’t sit well. Eventually the buddy said to Steve, “if you think you can do better why don’t you write your own bbs.” so Steve sat down and wrote a BBS (YBBS), and even sold a few copies. Fast forward, past ARPANET, to the internet evolution. Like overnight, everyone became the master of their own domain. SteveApple.com was launched and so began The Buzz In Steve’s Head. A few years later, the “buzz head” is buzzing on Steve’s WordPress CMS. Lets see what happens next in the digital evolution. 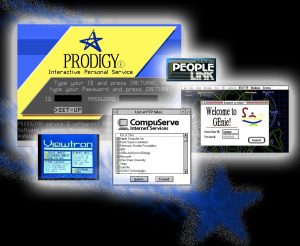 Compuserve, AOL, MySpace, etc., etc. All were giants at one time or another but none sucked so in so much personal content as Facebook. It will be quite a scramble when Facebook fades away. Make sure you have a backup copy of all those photos and stories you upload.